Stir 1 Super-Concentrated scoop (12.5 g) with 10-16 ounces of cold water and consume 30-45 minutes before beginning activity. Due to extreme potency, in the beginning it is highly recommended to assess tolerance by using 1/2 scoop. Do not exceed 2 scoops in any 24 hour period. KEEP OUT OF REACH OF CHILDREN. Not intended for use by persons under the age of 18. Contains caffeine. Do not combine with caffeine or other sources of stimulants. Do not combine with alcohol. Before using this product consult your physician or licensed healthcare professional, especially if you are using any prescription or over the counter medication or if you have any pre-existing medical condition. 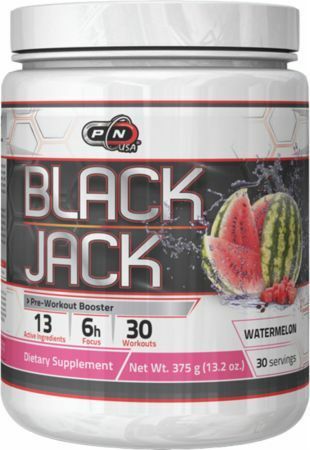 BLACK JACK is the ultimate pre-workout matrix designed to support energy, focus, power and stamina. * This unique combination of 13 scientifically proven ingredients will help you achieve workouts you never thought were possible. Strength, endurance, motivation - this formula will give you a powerful surge*. Pure Nutrition was found in 2011. At that time we already had experience selling other brands of nutritional supplements. Spending more than 5 years looking for the “perfect” products, In the end we have found out that there is only one way we can be sure we have the best quality products, the best tasting proteins and products that deliver uncompromised results - create our own supplement line. With so many good brands on the market, the beginning was very difficult. We started with less than 10 products, but currently our portfolio includes more than 230 different products. Since then we have committed to becoming one of the most trusted brands in the industry. Our mission is clear, our customers are our number one priority and therefore, we strive to provide them with nothing else, but premium-quality products at affordable prices. Several years later, looking back - we are satisfied with how the product line looks. The joy of customer satisfaction motivates us to continue doing what we do even better.